First of all, 86 is actually a verb, meaning 'to discard'. And the male protagonist is literally 86'ed like all of the eighty sixers. That concept of 86 is put into thorough use in this cruel novel, like the title suggests. And that's the selling point. Nothing else needs to be told, just read it. This barely feels like a LN, which is a good thing. No fan service confirmed. The premise is interesting "the dead aren't in the battlefield... but they died there". you can say that is pretty plain, but there is where the story has it own perk (or unique?) the author is pretty good in writing this (how he/she brought the story). If you say if there is something that look like this, then i'll answer "code geass boukoku no akito". Since it's pretty much the same I think (except the mecha/robot) pretty sure the background is european. he can hear the voice of "ghost" and "black sheep"
This novel really did a good job on showcasing a variety of emotions; cruelty, hopelessness, despair, foolishness and optimism. It's a grim and dark novel, not grim and dark like those edgy novels, but one that paints those themes in a slightly more realistic manner. People die, sudden and without warning. No sh*tty monologues in the middle of battle, hours of chanting magic while the opponent does nothing, nobody shouting his skill while executing it. It feels like a real battle without all that bullsh*t.
The worldbuilding is decent as of... more>> volume one, but. The real thing is that these characters grow on you. And that makes reading this novel rather painful as you reach the end of volume 1. Character development was not that elaborated and a lot of the characters weren't even explored fully. But I guess that volume 1 was only a prologue to the real story. So it can't be helped. There's not much to say about this story without spoiling and I feel that the synopsis does a good job at capturing the attention. While the story may feel confusing at time, with all the strange names, the way it's written is simply beautiful, as of now i'd suggest every reader bored with the same recicled stories to give this a shot, it's worth every star i've given. Code Geass + Valkyrie Chronicles + Gundam Iron Blooded Orphans type novel. Thinly veiled American-bashing genre, but decent read otherwise. Angsty teenagers set in a war between countries, ideological factions, etc, while trying to survive and work their way through social discrimination. 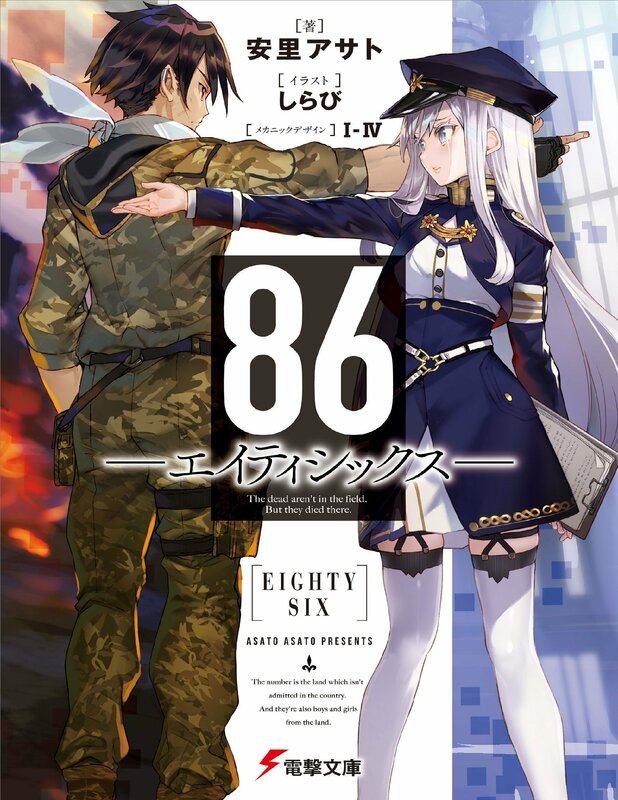 While Code Gaess was about colonization, 86 is a reflection of the WWII US internment of all Japanese-Americans in concentration camps, with the additional step of military conscription. Author tries to be cute/topical by adding in a layer of "drones" (humans "controlling" other humans remotely), but it's otherwise... more>> irrelevant. Somewhat believable ML & FL, both from different social stratas. ML is effectively a minority military slave forced to fight on the front lines to regain his citizenship, while the FL is from a privileged noble class directing the war effort from the rear. Internment and conscription is somewhat believable, it's happened in US history. But just like Code Geass, it takes it a step too far by pulling in other atrocities and nonsensically linking it all together. It's now internment + conscription + racism against ALL races (except those with white skin and silver hair), all while being the 1st democracy in the world and espousing democratic values. So that implies that majority of the democracy's citizens are hypocrites. I get that Japan has a recent revival of old grievances against the US (some of which are legit), but this is absurd. It's amazing that the novel actually won an award in Japan. I'm not certain the author has military experience or researched enough military history before writing this novel. Military technology, geography, strategic capabilities have always had an impact on doctrine, and adoption is fairly quick when any of these change. Yet 9 years after the Republic (the ML and FL's home country) was invaded, when they are fighting against extinction (not loss of their country since it's a take-no-prisoners situation against robots), they still act as if all lives are completely expendable. The spider tanks are really "Tachikomas" from Ghost in the Shell, but despite advanced weaponry they still fight close combat style. The "handlers"/"drone pilots" act like they are playing video games, even though the "drones" are real humans. Even if it's sacrificing conscripted minorities, it makes absolutely no sense that the country hasn't reformed their war plans or government. Worse, the govt is actively deceiving the populace that they are winning the war. And the populace actually believes it! How delusional can people be when they are eating scraps? How hard can it be to form an alliance with all the other affected countries? The Empire is basically like Germany in WWII. It's said the Empire shut down communications by sending out jamming signals. But they can walk over to neighboring countries right? A whole bunch of nonsensical sesquipedalian military terms are used. It's like the author found a military dictionary and threw in whatever he could. The sentences don't make sense, the conversations between military personal jumps about and don't make sense. The pacing, flow of emotions and character interactions are incredibly awkward. "If used over a long time, who knows the effect it will have... one or two Eighty Sixers dead won't matter, but what will happen if something bad happens to you?" Lena instinctively gave a displeased look. She knew Arnett was simply worried about her, but she could not help herself. "Don't do that... that's sleazy of you." Arnett finally waved her hand impatiently. "Okay okay. You're a curious one." An awkward silence soon filled both sides of the glass wall. Suddenly, Arnett gave a smile, as though to purge the silence. "Speaking of curiosity, Lena, want some Chiffon cake? Something new I made from eggs." What??? What's sleazy? Why wave your hand impatiently? Why the awkward silence? What does curiosity have to do with cake? Lost in translation... WTF. The leaps of logic are so bad you have to read a paragraph multiple times. It could just be a bad translation, but I doubt it. Borrows too many useless tropes. Besides Code Geass + Valkyrie Chronicles + Gundam Iron Blooded Orphans, we also have hints of The Matrix (robots/AI taking over), a collective "internet" consciousness (Ghost in the Shell/Star Trek Borg). Loving it so far, especially how the first volume end. About 3/4 into the first volume, I ask myself what would a good ending to this novel would be like (not just in term of the main characters, but as well as how to handle the swines), without ruining the realistic brutal war theme and logical to the story, and I just couldn't see how it could happen. But the author did it, and it was great and very satisfying. This story is so beautifully written, the angst is real, the feeling of desperation so perfectly conveyed that halfway thru the first volume I was so close to dropping this story due to the sadness contained. @ElRouge review changed my decision. I look forward to the chance when our ML and MC can meet face to face.